This is the first commissioned piece I ordered from Wings where I let his artistic talent and spirit wholly guide the design. I provided some information on things that were meaningful to me, and asked for a Moonstone cab, and Wings came up with a piece that is not only visually stunning, but spiritually fulfilling. 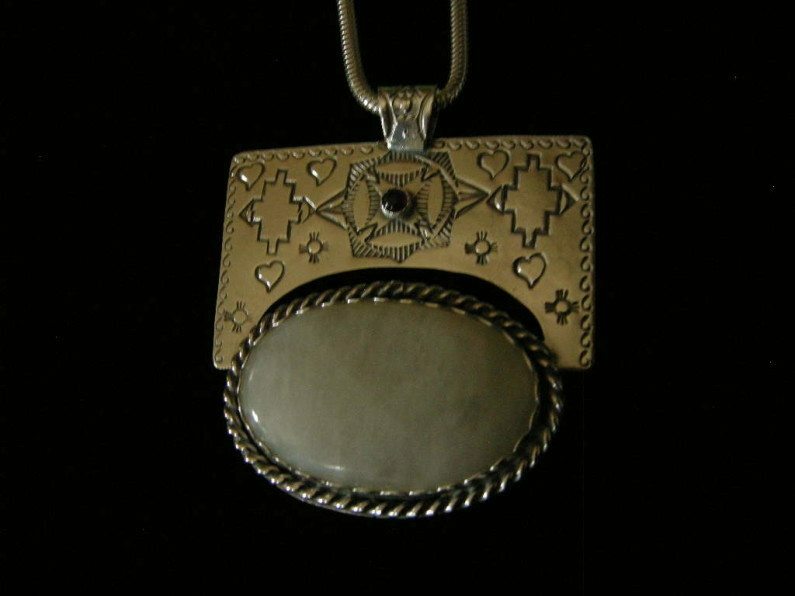 I wear it especially whenever I feel in need of guidance or protection, or just want the warmth of love to wash over me. There is a power to Wings’s creations, and I can feel it resonating when I put the necklace on. It feels like home, and I can give no higher praise than that. Photo, work, and work title copyright Wings and Aji, 2016; text copyright Andrea, 2016; all rights reserved. Nothing herein may used or reproduced in any form without the express written permission of the owners. Posted on Wednesday, March 2nd, 2016 at 7:17 am. Filed under: Client Testimonials Tags: Client Testimonials	RSS 2.0 feed.